For one of the very best Solana Beach golf deals, you need to experience a golf outing at Lomas Santa Fe Executive Golf Course in Solana Beach, Ca. This course is located approximately 3 miles from the Del Mar Fairgrounds, home of the San Diego County Fair and Del Mar Racetrack. The course has been voted one of the "Top Short Courses," by Golf Range Magazine and has hosted national junior championships for ages 9-10. The course was designed by William F. Bell in 1973. The 18 hole course is a par 56 (two par 4s), covering 2,431 yards from the back tees. Lomas Santa Fe Executive Golf Course is rated of 53.6 on Bermuda grass. This is a challenging "short" course. 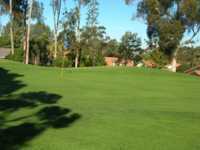 The course is characterized by sloping fairways and greens, 2 lakes, approximately 55 bunkers and great ocean views. If you are looking for Solana Beach tee times, Lomas Santa Fe Executive Golf Course tee times can be reserved online or by calling the course starter. The course does offer special promotions. Amenities include a practice putting green, rental clubs, cart rental, pro shop and a snack bar. Players enjoy the quality of this course. The greens are exceptional and there are plenty of bunkers. Overall, the course is a real challenge.